Film Reviews, News, Casting Updates and Analysis: The Silver Screening Room: Is Anybody There? 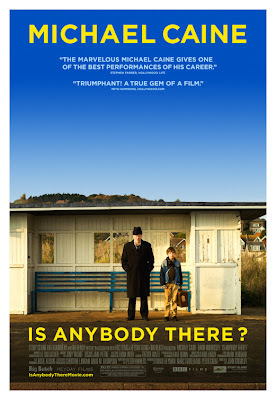 Because I love Michael Caine, because I had a free movie ticket, because there's nothing better to do on a Summer's eve in Tally, I went with some friends to see Is Anybody There? last night at my local art house cineplex. I'd been hearing good things, and I was delighted at the ensemble of veteran actors assembled, so off to the theater did I trip and go. Is Anybody There? struck me as a first-timer. Clearly, it was the work of a first-time director working with a first-time screenwriter, cut together by a first-time editor. Which doesn't mean it's bad. It's actually quite a good film, about a boy (Bill Milner) living in a rest home run by his parents befriends one of the residents, a retired magician (Michael Caine). So, it was quite winning and touching and humorous at times, but generally seemed like everyone involved was just a little inexperienced. And then I learned that director John Crowley, writer Peter Harness, and editor Trevor Waite are not only experienced, but two of them are actually sort of admired. Crowley and Waite, I mean. Doubly surprising was the revelation that I have actually seen and enjoyed other films Waite edited -- surprising because, besides Joby Talbot's intrusive and inappropriate score, the editing is the weakest part of the film, cutting away when it should linger, lingering when there is little need to, rendering confusing the simplest of scenes. As we left the theater, my roommate made sure to stay for the credits, and upon seeing Waite's name, proclaimed, "I'm never working with him." Harsh, perhaps, especially now that I know he did Prime Suspect: The Final Act. But still, there it is, the editing was jarring and the score intrusive. OK, that's the bad. The good, fortunately, comes from Michael Caine's brilliant performance as Clarence, struggling to keep his wits while slowly slipping into dementia. In fact, that's where the great comes from. I've never seen a Caine performance like this, one in which he gets to be crotchety, fun-loving, and so nakedly vulnerable. I read where someone called this his best since The Quiet American, but I would go a step further and say this is his best since Hannah and Her Sisters. Call me crazy, but there it is. Within his performance is all the bitterness that some people experience when facing their own mortality; the regret of past mistakes; the hope that there may be an afterlife. It's a beautiful and touching performance. Bill Milner does quite well as the boy he befriends. And old folks -- featuring Peter Vaughan, Leslie Phillips, and the late Elizabeth Spriggs -- do quite well with comic relief, but are not developed enough. Only Rosemary Harris (Aunt May in the Spider-Man films) gets a wonderful role as a former dancer who now has a plastic leg. She pulls a Hermione Baddeley, making a fully-realized person out of a sketchily-written role. Anne-Marie Duff, as Milner's struggling and strong mother, is also great, but that may also be because she is hot and a mom. The script could have stood with some rewriting. Some polishing on the Caine-Milner relationship. Some development of the old people. Less concern with the parents, to be honest, would have suited me. But overall, some good stuff is going on here. Bottom line: A sweet little movie whose actors are better than what they're working with. Especially Michael Caine.